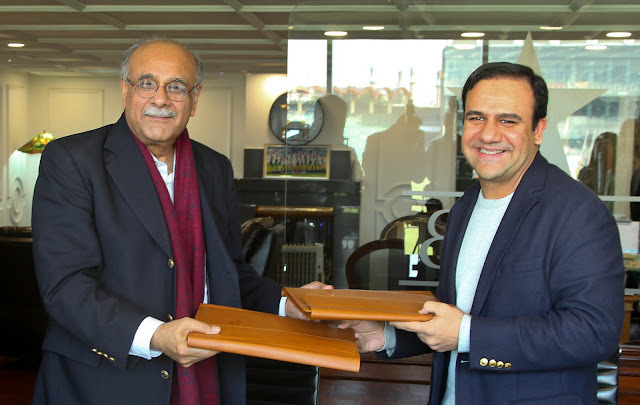 The chairman of the PCB, Mr. Najam Sethi, and Dr. Umar Saif, founder of the Vice Chancellor of Information Technology University of Punjab (ITU), signed the Memorandum of Understanding (MoU) to use “Insights” - a unique match analysis and scoring tool developed at no cost to the ITU for the coming edition of the Pakistan Super League (PSL) and other domestic series in Pakistan, including the Quaid-e-Azam trophy, the Pakistan Cup, etc. The system has been developed by Talha Rehmani and his team with the opinion and guidance of cricket experts such as Inzamam ul Haq, a legendary cricketer of Pakistan and current head coach of the Pakistan cricket team, and Mushtaq Ahmed, coach of Pakistan’s National Cricket Academy. Detailed assessment sessions were conducted with these mentors and PCB support staff such as analysts, qualifiers, coaches and other coaches. Insights is an expert player profile system developed by the Information Technology University research team, Lahore, Pakistan (ITU) for the Pakistan Cricket Board (PCB). The system contains a parallel scoring application, both on the web and on Android, where the scores of the matches with the smallest details are entered using only an Android tablet, which makes it very profitable. The scorer can enter a lot of additional information along with scores such as the location in the field, the terrain and weather information, the ball launch point, the swing and height estimate, and information. The system can be used simultaneously by two users to enter the details of the same party to cover it with greater precision, that is, a scorekeeper can add scores while an analyst can add field and field information, etc. The user can also enter details of each delivery event, for example, if a four-hit, the user can select, from a pre-populated list, the name of the shot, if the players timed it or if it was a mishit. Similarly, the details of a batter's dismissal, a career, a point or a six, all different types of scoring events can be recorded with just a few clicks. Below are some screens of the mobile interface. The data collected, both from coincidences and individuals, are then used to obtain both concrete and soft analytical results. This can be an important tool to track a player's performance from the root level to the top, identify weak and strong areas for hitters, identify trends and factors that affect the performance of each bowler, work on improving your defects and equipment selection. E.g. If the system identifies that a player is good against the turn, he may be selected to play in friendly spin conditions. On the other hand, if a player is weak against the turn, the repair work can be started.